Telangana Folk Singer Madhupriya recently became talk of the town and got focused during her fight with her husband turned lover SRIKANTH, is about to enter politics says sources. Is it true? 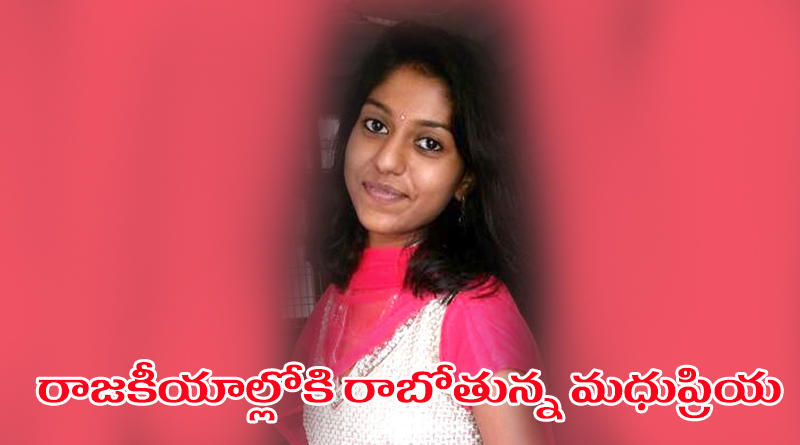 Is madhu priya stepping her mind towards politics? Yes of-course says the words of singer itself. The singer who has met Telangana Chief Minister K.Chandrasekar Rao is now expected to join the party. Recently during a TV interview, Madhupriya said that she played a major role in Telangana movement. The singer even added she brought up awareness in people with her songs from past six years by actively participating in telangana moment and due to her efforts and singing many were inspired and that helped the government to make its telangana state dream true and people of Telangana are living happily. But my own life is a miserable one now. She even added KCR has done a lot of favors to those who took part in Telangana movement. So Madhupriya also looks the same way to sustain. Even though she never made it an open statement, she said she will join politics and TRS Party. But she also said, only KCR should invite her! We think Madhupriya still needs to mature a lot and know more of what politics are and many advised her to get her life settled well before she enters politics and thinks of politics.